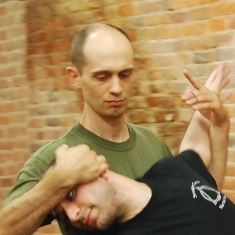 Bill Koenig, Karate and Systema instructor, is based in Utica, NY. Bill Koenig started training in the martial arts in 1993 at the University at Buffalo. For two and a half years he practiced Siedo Karate under Chris Caile. After graduating from college with a degree in History, he studied various martial arts until joining North American Goju Karate under Shihan Efren Reyes, where he has received his 5th degree black belt in Karate and certification in joint-locking. He was an assistant instructor for seven years until reaching Sensei level in 2007. Bill has also trained in the Russian Martial Art of Systema since 2002 under Vladimir Vasiliev, who has certified him as an instructor. Along with his own Systema class and teaching Goju Karate under Shihan Reyes, in 2007 Bill created Straight Circle Martial Arts. This school teaches Systema/Traditional Asian Martial Arts and sports body mechanics. All content © Bill Koenig unless otherwise stated.